1. Preheat the oven to 170°C, gas mark 3. Lightly grease the holes of a 12-hole non-stick muffin tin with oil. 2. Mix the egg whites and salt together in a bowl until frothy. Add the sugar and coconut and stir until thoroughly mixed. 3. Divide the mixture between the holes in the tin. Lightly press into the bottom and up the sides of each one, leaving the edges loose and rough to look like nests. 4. Bake for 15-20 minutes, or until golden in colour. Remove from the oven and press the centres down with a teaspoon. Leave to cool completely in the tin then run a knife around the edges to release them. 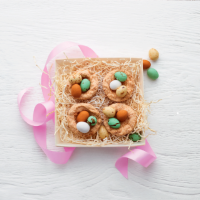 Fill with Easter treats such as mini eggs and toy chicks.